A new public park will replace the open-air carpark at Queen Victoria Market under the latest proposed redevelopment of the heritage-listed landmark. 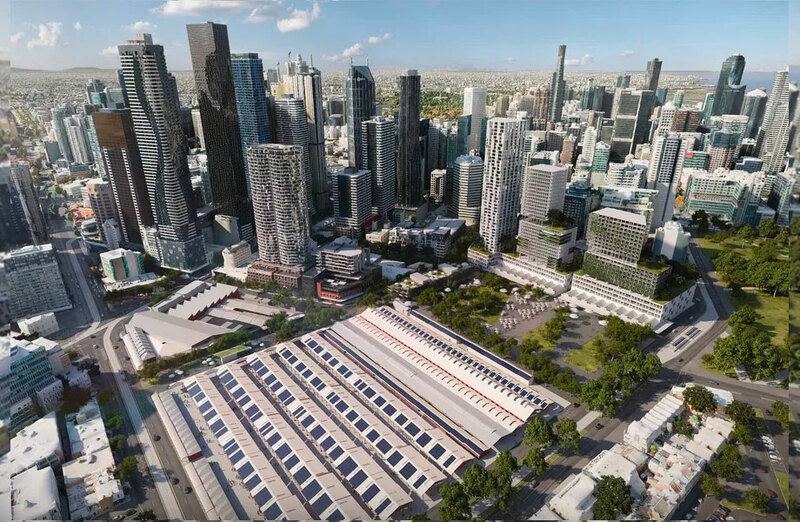 The renewed $250 million proposal for Queen Victoria Market will overwrite the previous proposal to construct a four-storey underground car park beneath four of the heritage-listed sheds. Heritage Victoria would eventually reject plans for infrastructure that required digging under the heritage listed sheds. The new proposal, by NH Architecture, will instead opt to deliver 1,000 car parks within development sites adjacent to the market. Under the new plan, $19 million would be invested in 500 new parking spots at a future Franklin Street site, on top of the 500 parking spots currently being built at the Munro community hub on the corner of Queen and Therry Streets. The repositioning of the car parking allocation would free up the existing open-air carpark to be developed into a new 1.5 hectare civic space, to be called Market Square. The proposed open space would be developed in two stages, following the relocation of car parking from the existing outdoor car park to the two new development sites. “Under the plan, once the new car parks are complete, the existing asphalt carpark will become a 1.5 hectare public open space called Market Square,” Capp said. Last year, Queen Victoria Market became the 114th location to be added to the nation's list of important heritage sites. The market has traded continuously since 1878 and attracts approximately 10 million visitors each year. The revised option recommended by the city’s planners would also see all new and upgraded facilities delivered above ground, including trader storage and amenities, and centralised waste management and recycling facilities for the Meat and Fish Hall at the G shed site. Instead of the underground storage proposed in the rejected plan, $6 million would be invested in creating 2,200sq m of cool and dry storage for traders at their stalls. “We’ve worked with traders, shoppers, residents, the Victorian Government, Heritage Victoria and the wider community to build a way forward that will allow us to create a thriving open-air market for generations to come,” Capp said. The new plan is said to be deliverable within the previously announced $250 million budget allocated for the market renewal.